Cantieri Navali Arno renowned for the range of there Leopard Yachts have announced that the luxury performance yacht building company will become independent from the 33 year collaboration with Rodriguez Group. Previously Rodriguez Group has undertaken the marketing efforts for Arno Leopard, however from now they will handle their own day to day marketing and selling, rather than simply focusing exclusively on yacht building. As well as luxury yacht design and production Arno Leopard will carry out the full circle of yacht sales too, which is a change from having the Rodriguez Group managing the market for them. The collaboration by Arno Leopard with Gerard Rodriguez started in 1975 and was a perfect union between a shipyard dedicated to building and improving the quality of its yacht, and a group exclusively concentrated on selling them. 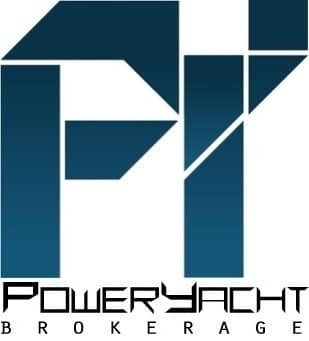 Cigarette and Marilyn DeMartini jointly announced that her agency, PR Power will represent Cigarette, handling press and public relations for the South Florida-based iconic builder of custom powerboats. DeMartini worked with Cigarette for 5 years and rejoins the company with enthusiasm. Cigarette Racing Team is celebrating its 40th year, tracing a history from the notorious founder, Don Aronow, through decades of abundance and a period of financial disarray, during which Braver, a successful Chicago-based businessman, bought the company. In 2001, he bought a 42' Cigarette boat, learned about the company's unfortunate business situation and decided that he could better market the brand and its assets. PR Power is a Ft. Lauderdale-based firm that grew from DeMartini's free-lance writing and PR business. Though many of her clients remain marine-based, she has diversified into other businesses. Marine industry veteran Tony Esposito joined DeMartini when the agency added the U.S. representation of the UK-based Powerboat P1 World Championship. The agency also provides graphics, advertising, social networking and marketing services. PR Power will work with Cigarette's other contractors who handle advertising and web-based marketing, as well as the European dealer network. Corporate leaders in their respective fields, GEICO Insurance, AMF Offshore Racing and Cigarette Racing Team have formed a new relationship to continue the targeted marketing of the GEICO brand to the performance market, using offshore powerboats as the vessel. AMF Offshore Racing purchased a Cigarette 38 Top Gun as its VIP boat and will brand it with the GEICO Caveman graphics to provide client and sponsor rides and pace boat duties on its extensive "Miss GEICO" US Offshore Powerboat Racing schedule. Miss GEICO Racing may not yet be a "household" word outside of the powerboat market, but the widely projected and promoted GEICO advertising campaigns--from the GEICO Gecko to the Caveman, to the more recent googley-eyed stack of money are ubiquitous. GEICO Insurance's VP of Marketing, Ted Ward, has been called a "marketing master" by the Washington Post and his actions, propelling GEICO to become the third largest insurance company in the country, substantiate the claim. When businessman, Gary Goodell, AMF consultant and GEICO representative, presented Ward with a sponsorship opportunity for the three-time World Champion AMF (America Moving Forward) Offshore Race Team, owned by South Florida entrepreneur, John Haggin, Ward "got it." According to Goodell, he recognized that powerboat racing was the perfect venue to build a platform for GEICO's new powersports insurance program that includes boats, motorcycles, RVs, ATVs and personal watercraft. Skip Braver, President and CEO of the South Florida-based Cigarette Racing Team, recognized when he bought the iconic powerboat manufacturing company over seven years ago, that the company's heritage-and even its name, had been based on the passionate and successful offshore racing experience by notorious founder Don Aronow. However, Braver had a different strategy and decided to focus on building the finest quality recreational powerboat and to market it via consumer boating events, not racing. When Haggin approached long-time Miami Cigarette dealer, Lip-Ship Performance about buying a Cigarette to add to the team's fleet, owner Phil Lipschutz, a World Championship racer, went to Braver and asked him to lend factory support to the deal. Recognizing the powerful marketing support that GEICO puts behind the fan-favorite team, Braver had to concur. The AMF race team consists of World Champion racers who compete in three top-brand "Extreme" Class "Miss GEICO" catamarans, powered by Lycoming helicopter turbine engines with speeds in excess of 185 mph. Its new Cigarette is a single hull, "VeeBottom", a classic 38' Top Gun model, the most popular Cigarette model for over three decades; it is powered by Mercury Racing 525 EFI engines, known as the company's most reliable and maintenance-free power package. GEICO, a Washington DC-based company spends hundreds of millions per year in marketing. The AMF/Miss GEICO Offshore Racing Team is part of the Powersports division, a small, but growing portion of the company's overall budget. GEICO provides marketing materials and supports the team's racing and public relations efforts as it travels to races, boat shows, air shows-any location where tens to hundreds of thousands of people gather. The race boats are all painted in the signature "safety green" chartreuse and branded with the "Miss GEICO" graphics, a bikini-clad female version of the GEICO Gecko. The Cigarette GEICO Caveman boat is planned to debut at the September 11-13 New York City Superboat International race, a series to be televised by CBS Sports Spectacular in the fall. The event will celebrate the 400th anniversary of the discovery of the Hudson River by Dutch explorer, Henry Hudson, and the Prince of the Netherlands will be among its VIP passengers. Ferretti S.p.A. announces the finalisation of its debt restructuring, according to an agreement which also envisages: reducing the long-term debt from about €1.1 billion to around €550 million against a conversion of credits into exit participation rights; the inflow of new funds through a capital increase of €85 million of which €70 million underwritten by Chairman Norberto Ferretti and some of the Group management with the remaining €15 million by Mediobanca Banca di Credito Finanziario S.p.A.; further medium-term credit facilities to fund working capital requirements totalling €65 million; extension to medium-term of existing short-term facilities for a further € 24 million granted by three major financial institutions already Ferretti group partners. The Group’s equity is now held by Norberto Ferretti and the Group’s management (38.2%), Mediobanca (8.8%) and senior and mezzanine lenders for a total of 53% in exit participation rights. In particular, as a result of the agreement, Norberto Ferretti, the Group’s management and Mediobanca hold 100% of the Group’s voting rights. Norberto Ferretti, the Group’s management and Mediobanca have finalized the acquisition of Ferretti S.p.A. and implemented the capital increase through new Co Ferretti Holding S.p.A., for which Mediobanca also acted as financial advisor. Today, the Group’s shareholders also appointed the new Board of Directors, which will remain in office for the 2009–2011 period, until the General Shareholders' Meeting convened to approve the financial statements for the year ending August 31, 2011. The new Board of Directors is composed of the following members: Norberto Ferretti – Chairman, Salvatore Basile - Chief Executive Officer, Alessandro Foti – Vice Chairman, Giancarlo Galeone – Director, Lamberto Tacoli – Director, Augusto Fantozzi – Director, Mario Giuseppe Rossetti – Director. Salvatore Basile is the new Chief Executive Officer of Ferretti S.p.A. Chairman and Founder, Norberto Ferretti, the management and Mediobanca express their full satisfaction concerning the arrival of a highly experienced businessman and manager of Salvatore Basile’s stature. The appointment of the new Board of Directors of Ferretti S.p.A. and Salvatore Basile as Chief Executive Officer represents a further step forward with the implementation of the Industrial Plan started in recent months, which will allow the Group to consolidate its leadership in the boating sector and to continue with the process of growth that has characterized its 41 years of history. The Ferretti group, a world leader within the sphere of the design, construction and sale of luxury motoryachts encompassing a unique portfolio of nine of the most exclusive brands in the nautical world, is presenting a new, important technological innovation: FAIR (Ferretti Analysis Integral Recorder), the very first integrated system for monitoring the performance of group yachts during testing, enabling not only simultaneous acquisition of operating data, but also their analysis and processing. The system, exclusive to Ferretti group yachts, is yet another significant achievement in terms of research and innovation, enabling the group to guarantee clients a product which has been tested thoroughly and objectively. In fact, FAIR, as in “right” and “truthful”, enables testers to determine whether a yacht complies with strict tolerance parameters, both immediately and clearly. Moreover, it shows if she presents operating faults or deviations compared to the standards of the model and the project curves, without, in any way, influencing test times and procedures. This system will thus enable Ferretti to determine, both truthfully and correctly, the conformity of its yachts to the specifications set down by the AYT (Advanced Yacht Technology), the Ferretti group’s naval research and design centre. FAIR is, therefore, a new, important result for the Ferretti group within the sphere of the quality of its yachts. For clients, it will be a synonym for total reliability in terms of the data measured and their yacht’s conformity to the reference specifications. Developed by means of “star” architecture, FAIR enables a continuous, automatic flow of data by means of a ‘plug and play’ interface which connects the system to all the information sources. With a simple click made by the user, over thirty important measurements relating to the engines (from the longitudinal and transversal trim thanks to a bluetooth inclinometre, studied and designed exclusively for the Ferretti group, to trim tabs positions, helm angle, engine revolutions, consumption, range, speed, veer ranges and much more) are registered simultaneously at a one hertz frequency. This enables synchronisation and integration of all data of interest coming from the different sensors and subsystems on the yacht (which have been separate one from the other to date), creating respective LOG files for each size and correlation. The system also enables synchronisation with other acquisition systems, particularly high frequency detection apparatus for measuring vibrations and dynamic stress. Approximately 150 Formula Team members gathered together on June 15, 2009 at Formula’s Decatur, Indiana, facility, to enjoy a pizza party hosted by the members of the Formula Boats Forum, a group of Formula owners who share their thoughts and ideas about Formula boating online. The group came together to show their appreciation of the Formula Team (and Formula’s outstanding product) by providing the Team with 56 pizzas and nine cases of beverages! In a move to strengthen its growing presence in Australia, Grand Banks Yachts today announced the opening of a new sales office to manage distribution, service work and customer support for owners and new buyers across the region. Grand Banks Australia, based along the Gold Coast in southeast Queensland, brings to the market a highly qualified team with many years of factory experience and in-depth product expertise. At the helm is Hank Compton, a former factory manager for Grand Banks Yachts and more recently the company’s sales manager in this region. Hank and his sales team are backed by a service crew that boasts more experience in servicing the current GB model range than anyone else in Australia. Grand Banks Australia is already preparing for this year’s Sydney International Boat Show, with a display that will feature the highly-acclaimed new 41 Heritage EU. Equipped with the Zeus propulsion system and joystick docking control, the 41EU offers an unmatched combination of swift performance, sophisticated styling, and the meticulous quality and craftsmanship people have come to expect from Grand Banks. The appointment of Grand Banks Australia is part of the company’s decision to part ways with Riviera’s R Marine network as its authorized distributor in Australia. Riviera recently announced plans to restructure its business to better deal with the current economic climate. At a time when many boatbuilders are cutting operations and distribution, Grand Banks Yachts continues to show strength by growing its global footprint. In addition to the new sales office in Australia, the company recently appointed two new dealers along the Asia Pacific Rim, in Hong Kong and South Korea. Grand Banks was also recently named “Best Asian Motor Yacht Builder” for the second year in a row at Asia Boating Awards. International Shipyard Ancona (ISA), received a new travel lift that can launch vessels up to 400 tones. 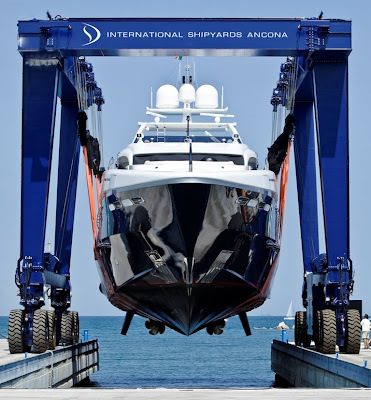 The new service will enable ISA to further offer its services to yachts in its Ancona based shipyard. Cimolai Technology, an Italian based company, versatile in the field of design and fabrication of equipments meant for special lifting and transportation operations, supplied the new lift. The lift will not only add greater capability to the yacht but will also add more flexibility for projects the shipyard can accommodate. The lift also allows all sort of different maneuvers, including diagonal and 90 degree movement. Apart from this, the yard has also included a 11 m wide tank with a depth of approximately 6 m, which can be used in conjunction with the new travel lift. These new additional services have increased the level of service and ability of the yard. The first yacht to attain the lift services was a 44 m Dutch build yacht, which needed some warranty work to be done on the yacht. Morgan Yachts, the brand of Aicon Group specialized in the design, construction and marketing of yachts in the Dinghy, Lobster Boats and Fast Commuters segments, has finalized an Ambassador Partnership agreement with Sparkman & Stephens for the sale of its classic motor yachts range in the United States of America. Sparkman & Stephens is the first Morgan Ambassador and will be an authentic representative of the Morgan brand in the American market. Pearl Motor Yachts, one of the UK’s luxury yacht makers has partnered with Bentley Motor Cars to offer its clients a very exclusive special offer - a complimentary Bentley with the purchase of every Pearl 60! The remarkable offer will only be available for a limited time and will entitle anyone buying the prestigious flagship Pearl 60 to a Bentley GT Continental Coupe, ensuring sheer luxury both on and off the water. The new Pearl 60 is renowned for its expansive, open-plan design that positions the two principal cabins at either end of the yacht for ultimate privacy. The choice of 8 or 10 berths also gives owners complete autonomy over the layout as well as a wide choice of internal finishes such as satin walnut joinery, contrasting leathers and a wide choice of luxury wall and ceiling linings. Other features include luxury corner sofas to maximise space further, a bar area for entertaining, wooden floors and plasma TV’s. Powered by twin 775hp Volvo engines, the Pearl 60 offers the latest technology including the new generation Garmin touch screen navigation system and Wesgarde touch screen integrated digital monitor and control system. Externally, sleek lines and innovative features include the hydraulic bathing platform and aft sunroof system as standard features. Pearl’s exclusive offer will be available on all Pearl 60’s ordered before 20th September 2009. The Pershing Stars parade 2009 livened up Porto Rotondo with the sportiest jewels of the sea during three days of games and relaxation. From 26th to 28th June, Pershing and Stardom made a date with their owners, offering them the chance to experience the magic of the Sardinian sea firsthand. The long weekend devoted to Pershing owners came to an end on the 28th June. The event livened up Porto Rotondo with games and competitions, in line with the sporty spirit which characterizes the brand philosophy. Pershing, one of the world leaders within the sphere of designing, building and marketing luxury motoryachts, and Stardom, Pershing's exclusive distributor for Italy, decided to pay homage to their clients with an exclusive event, based on fun and excitement, in order to enjoy unique moments together on-board and experience the sportiness of the many models which form the fleet, firsthand. The climax of the event was undoubtedly represented by Saturday 27th, when all the owners were involved in breathtaking competitions, challenging one another in two competitions which put their physical skills and creativeness to the test. The day began with a true challenge in open sea, organised and supervised by the Portorotondo Diving Club, in which owners were called upon to test their physical performance, diving to a depth of 20 metres. Exceptional guest was Umberto Pelizzari, world free diving champion, scholar and lover of the sea, who presented the marine beauties of the waters of Sardinia and showed those present how to carry out the first test. Owners were then involved in a photographic treasure hunt of the marine world, before returning to the port for a relaxing afternoon and gala evening in the exclusive setting of Hotel Sporting Porto Rotondo. The winners of the treasure hunt, namely those who best interpreted the spirit of the challenge, were presented with their awards during the evening: third and second places went to owners Roberto Calò and Marsiglio Marani respectively, whilst first prize was awarded to goalkeeper of Italian football team Inter, Francesco Toldo. Moreover, at the end of the evening, the special award placed at participants' disposal by one of the official sponsors of the event was assigned. Parmigiani Fleurier, top quality Swiss watchmaker, has developed a close and indeed prestigious partnership with Pershing. After a lucky draw, owner Alessandro Viani won a Pershing 005 underwater chronograph, perfect symbol of the sporty, elegant man. Special thanks went to the sponsors, too: Audi, Dolcefarniente, Inoxtar, Tesla Motors and Cmm Yacht Service. An attractive roundup of the most representative models of the Pershing fleet embellished Porto Rotondo marina for the entire duration of the event, offering an extraordinary view of soaring hulls with sporty, elegant lines. It was held on June 20th at the Wolffer Estate Vineyard, in Sagaponak (New York), the ‘Ecofaboulous’ event, a charity auction linked to eco-friendly projects. The cocktail and gala evening, that saw the participation of around 400 guests, created the occasion to present many products that, thanks to innovative technologies, reduce the pollutant emissions, like the new Long Range by Mochi Craft. Riva, that participated to the event thanks to its exclusive dealer for the US, Allied Marine, put at disposal for the auction a two-hours cruise in the Hamptons on its iconic model: the Aquariva Super. The 33 footer was also displayed at the entrance of the location where the event took place, giving guests the chance to admire from closer the pure and elegant lines which have made it a model of timeless elegance and style all over the world. Riva conquest of the Oriental lands keeps going on. To the existing dealership of Singapore and Hong Kong, in fact, a new agreement has been added, signed with the Lyu Company, a trading society for luxury brands based in Japan. This new partnership is part of the general Riva project to expand in the new emerging markets, first of all in the Asian one. The agreement includes the exclusive distribution for Riva on the Japanese territory, beside the promotion of the brand through a series of dedicated events, able to let the invited guests live the Riva style, bringing them inside the world of the Myth. 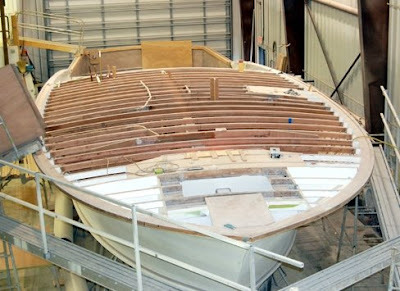 Australia’s largest luxury boat builder, Riviera, has made considerable progress in the eight weeks since the voluntary appointment of Receivers on May 8, 2009. Since the appointment of Receivers and Administrators, the company has received strong support and encouragement from its global owner and dealer base along with hundreds of suppliers, many of whom have publicly stated their desire to see Riviera succeed and continue to grow. The company is currently being restructured in order to survive the current economic climate. The restructure has taken the form of re-energising and rationalizing the supply chain, staffing levels and external contractors, streamlining administration functions and driving greater efficiencies in manufacturing. The net effect to date has resulted in manufacturing being back on line with completed boats again being delivered to the company’s dealer network. At the same time, the company’s drive to continually innovate the design of current and new models continues unabated. Interest levels and firm sales of Riviera's stunning new 5800 Sport Yacht with triple Volvo Penta IPS pod drives, has been considerable given current market conditions. To date the company has signed contracts for eight of these new models including the sale of a 5800 Sport Yacht to Italy for delivery in early 2010. In preparations for the Sydney International Boat show to be held from July 30 to August 3, the company’s design and new model introduction teams are involved in the final manufacturing stages of three new models, which will be officially launched in Sydney. Riviera will unveil the 5000 Sport Yacht with the new Cummins Mercruiser Zeus pod drive system, an enclosed 51 Flybridge with triple IPS drives and a considerably enhanced flybridge design for their popular 47 enclosed model. In addition the 5800 and 3600 Sport Yacht, also with the innovative IPS pod drive system, will make their Sydney debut at the show. Riviera will make a strong statement to the market in Sydney with its 2,500 square metre, 14-boat display, the largest single exhibit at the Darling Harbour based show. More than $21 million of new Riviera boats from 38’ to the company’s flagship 70’ fully enclosed flybridge, will be on display. Also at Sydney International Boat Show, Riviera will have senior designers and representatives from the company's new Motor Yacht partners on hand to discuss the many options this exciting new addition to the Riviera range offers. Three new Motor Yacht models have recently been announced in 73, 78 and 85 feet in length. The display at this years Sydney International Boat Show will be a Riviera brand display. Earlier this week, Riviera announced plans to focus exclusively on the development and manufacturing of the Riviera brand of boats for its large client base and dealer network around the world. As a result, effective July 1, 2009 the company separated from Princess Yachts and Grand Banks Yachts as the distributor for Australia and New Zealand. Riviera also announced earlier this week that the Experience Centre located at the company’s Coomera Gold Coast facilities has re-opened following a refurbishment. This 240 square metre retail store features a $150,000 state-of-the-art marine electronics display, boat interior design studio with resident interior décor consultant and a display of thousands of colour and fabric samples. The Centre also houses a Riviera lifestyle store with distinctive clothing and giftware. A spare parts service adjacent to the Centre supports Riviera boat owners who are upgrading or refurbishing their boats. The camaraderie, priceless memories and serenity of cruising, is what Terry Mallon and Rod Anderson enjoyed when they travelled to Canaipa Passage with the Riviera family this week. They were among a fleet of seven Riviera luxury cruisers. With 30 crew members they embarked on a 60 nautical mile cruise from Sovereign Islands on the Gold Coast north to Canaipa Passage, the spectacular waterway between Russell Island and North Stradbroke Island. For Terry Mallon and his wife, Barbara, it is the sheer exhilaration of cruising aboard their 4400 Sport Yacht that made this journey so special. Terry said it was a fantastic experience and recalls the highlight of his trip when his brother fell out of the tender. Terry said boating was a great way to bring the family together and he enjoyed taking his children and grandchildren out for a cruise before anchoring in a quiet bay for lunch. He said he enjoyed the company of like-minded people and looked forward to the next Experience to Fraser Island in September. This is the fourth Riviera Experience for Rod and his wife, Donna, who say they wouldn’t miss it. He said the voyage to Canaipa Passage with R Marine was what he expected ‘a well organised trip with plenty of food and plenty of good company’. Rod said the myriad memories he has of cruising in his Riviera 430 were ‘priceless’. Rod said he felt comfort in the knowledge that he was travelling with the safety of the Riviera family and its support network. He has also formed new friendships with fellow boat owners during the Riviera experience. On Saturday, the Riviera family was treated to a barbecue lunch on the beach, courtesy of R Marine Queensland; followed by children’s activities and a sunset walk along Slipping Sands. Later that evening there was a Bonfire on the beach where they enjoyed the simple pleasure of toasting marshmallows. On Sunday they returned home, arriving back at about 2pm after a leisurely morning at Canaipa Passage. It is another tribute to the youngest boat of Cantieri di Sarnico. Launched in 2006, it was awarded the “European Powerboat of the Year” in 2007, then it was proposed in the special edition Perla in 2008 and now the Spider has achieved the prize Forcola d'Oro 2009. This is the first edition of this initiative which aims to promote and enhance the excellence of “Made in Italy” in the marine industry and it was set up by Venice Expo, organizers of the event, and Fondazione Valore Italia, the Organization promoted by the Ministry of Economic Development in order to perform the research and development of the Italian production system. The jury, chaired by professor Massimo Arlechino, President of Fondazione Valore Italia, and composed by ADI Centro representative architect Stefano Salvi, by experienced designer in nautical industry Massimo Paperini, by the director of Yacht & Sail (magazine & TV) Andrea Brambilla, and by Port of Venice Admiral Mario Fumagalli, awarded the Sarnico Spider as best Italian boat in the category from 12 to 24 meters. The prize wants to highlight the products which are characterized by technological innovations, design, new materials, safety and environmental compliance. The ceremony took place at the presence of the Minister for Public Administration and Innovation Renato Brunetta and the prize was withdrawn by Cristina Volpi, Sales Manager of Cantieri di Sarnico, during the Mare Maggio, the cultural event organized by Expo Venice in the “Arsenale” of Venice. The Spider represents the will to grow through the research of new concepts of style and improving the performance. The aim of the project remains the desire to combine speed with comfort and elegance with sportiness. Just to get these results, the shipyard worked with two of the most famous designers: Victory Design, a team that has lots of experience and success even with racing boats, and the naval architecture studio Nuvolari-Lenard, famous throughout the world for their style. Many Spider versions, from the Perla model to the V model, available in many different colours, allow to the owner to distinguish himself as well as the Sarnico style, once again awarded. Sea Ray Boats and Russell Lands on Lake Martin announced today that more than 4,000 boats and 35,000 people attended Alan Jackson’s headline performance at Saturday’s AquaPalooza Signature Event on Lake Martin, Ala. The event, held at Kowaliga Bay in the heart of Russell Lands on Lake Martin, set a record for any AquaPalooza Signature Event. Officials from the Alabama Marine Police, who were among several official agencies in attendance, confirmed the numbers for the day. This year’s Signature Event attendance numbers represent an increase of more than 50 percent over last year’s numbers, making it the largest Signature Event in the four-year history of AquaPalooza. The weekend event, held July 24 to 26, featured a concert by Jackson, as well as up-and-coming artists Matt Stillwell, the Carter Twins, Caitlin and Will, and Jypsi. Boats were packed stem-to-stern for over a mile, and many fans donned their inner tubes and water noodles to paddle close to the water-pit at the bottom of the stage. Jackson pulled up to the dock at the Russell Lands’ Kowaliga Marina in his 1923 Hacker Craft, and played hit songs from his current platinum album, “Good Time.” During the show, which was taped for CMT’s Labor Day special, “Alan Jackson AquaPalooza Live on Lake Martin,” Jackson spoke movingly about childhood visits to Lake Martin with his family. Jackson’s encore included a performance of the Hank Williams classic “Kaw-Liga,” which Williams penned at his historic cabin on the lake. The event not only provided a good time for all, but also energized the boating community. In addition to the Signature Event on Lake Martin, this year’s AquaPalooza consisted of more than 100 events held around the world during the last two weekends of July. San Juan launched ots fiftieth yacht with the launching and deliverey of a San Juan 38 hull no.032. The 38 was delivered to a Seattle couple, in Anacortes. Founded in 1998, this launch in an important milestone for San Juan Yachts, who after this construction fifty hope for further deliveries of there quality Down East Traditional lobster yachts in the future. Two octogenarian Sunseeker powerboat enthusiasts turned back the clock yesterday when they crossed the English Channel in a fully restored Sovereign 'Hostess 17', one of the very first models built by Sunseeker when it launched its building programme over 40 years ago. The voyage of rediscovery was an opportunity for the pair, who began their sea-faring careers together, to celebrate the success of Sunseeker and the quality of the craft's build, which has been in regular use during the 40 years since its production. Now completely restored to its original condition, the Hostess was discovered over six years ago near the Sunseeker yard in Poole and has since been displayed by the company at various international boat shows and more recently in the latest James Bond movie, Quantum of Solace. Setting off the morning of 1st July 2009 from London's Putney (Chelsea Harbour) at 05:45am the two men, Geoff Tobert, who is just months away from his 81st birthday, and boating journalist Ray Bulman, 79, travelled the 280 miles within 15 hours in triumphant style. The journey began with a smooth run down The Thames, which was followed by more challenging conditions off North Foreland where the Thames Estuary meets the English Channel. Refueling at Ramsgate at 10.15am, the pair later stopped in Calais to toast the completion of half the journey at approximately 2.30pm yesterday with a glass of Sunseeker Champagne, before heading back to Chelsea, where they were greeted by Sunseeker staff, family and friends who were eagerly awaiting their arrival at 8.30pm. Of important significance is that one crew member, Geoff Tobert, sold the original production moulds to a young Robert Braithwaite CBE, Sunseeker founder and CEO, in the 1960s while Ray Bulman tested the boat for Motor Boat & Yachting in February 1970. The Sovereign 'Hostess' was acclaimed for her quality of performance and exceptional comfort and this philosophy in design has prevailed through to today's range of models. As well as being sponsor of the event, Sunseeker International was represented within the ride, as for the second year running a team of cyclists from the company took part in the event. The team completed a challenging 100 mile journey to raise money for the charity, which works to improve the lives of people affected by cancer. The team included Tim Balmer, one of Sunseeker's drivers, who dedicated his ride in memory of his former colleague Dave Millar, a Sunseeker transport driver who recently died of cancer. The Macmillan Dorset Bike Ride takes place annually on the first Sunday of July, and this year was sponsored by Poole-based Sunseeker International as part of its commitment to locally-based charities and supporting the local community. The event was also supported by Primera Sport and promoted by media partner The Daily Echo and Dorset Echo. In 2008 over 800 cyclists took part and the event raised over £83,000. 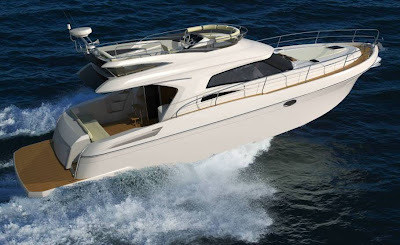 Azimut Yachts presented its new 53 of the Flybridge Range during its third Yachting Gala which for this year was show cased as the first edition at Marina di Varazze. The Azimut Benetti Group has made it a tradition to present new models during its Yachting Gala organized for its clients. The new model presented at the 2009 Gala continues the foundation of offering new hull color themes after the green used for the 58, the different blue for the 70, now is the turn for an ocean purple for the 53. The 53 will surprise the competition in its size offering a package similar to the 58 all in a slightly smaller offer. The saloon is of a similar size, with the helm being located to starboard with a double seated helm station. The three double guest cabins are also of similar concept to the 58. With a full beam owners cabin with en suite to port side and a breakfast table, two by single berths guest cabin to starboard, VIP cabin to fore, and guest shower head. There is also an optional crew cabin with head aft. Azimut also say the flybridge of the 53 is the largest in its size of boat. Power will be from twin Cats 715hp each, with max speeds of 31 knots and cruising of 28. The 53 Flybridge is one of eight new models to be presented by the World famous Italian builder for its fourteenth anniversary, which will include a new entry level 38 footer, up to the bigger 100 Leonardo. Sea Ray has featured the revolutionary Cummins MerCruiser Diesel (CMD) Axius sterndrive control system to the 350 Sundancer. This model was the first to emerge from CMD’s dedicated Vessel Integration facility and was shipped Down Under, to Adelaide. The 350 Sundancer is the flagship of Sea Ray's Sport Cruiser line and the Axius sterndrive makes it incredibly driver friendly. The Axius system utilises independently articulating sterndrives, and it allows even a novice captain to easily make intricate slow-speed boat manoeuvres, erasing much of the anxiety often associated with docking. An Axius-equipped boat can be manoeuvred laterally or at an angle and can spin inside its own length with the simple push or turn of the joystick. It’s a perfect match for the 350 Sundancer which features a spacious, open cabin with a double island V-berth, and convertible double berth mid cabin. The galley has solid surface countertops with ample storage above and below. The cockpit has a solid surface wet bar with a refrigerator standard. As with all Axius boats, SmartCraft Digital Throttle and Shift is standard for reliable shifting and smooth, even throttle response from idle to top speed. The 350 Sundancer is also offered with SeaCore corrosion protection system as optional on the Bravo 3 sterndrives for longer life in the harsh marine environment. The Axius system also includes an integrated autopilot system that provides auto-heading functionality, with the addition of an optional compatible chart-plotter. Italian ship builder Cantiere di Donna continue to upgrade the Serapo range, with the launch of the new 38 Serapo. Presented as a project in the fall of 2008, the new mid sized 38 Serapo is further evolution of the themes introduced with the 30 Serapo of a traditional gozzo cruiser, but with more modern elements added to it. The hard top, the large view window at mid ship, and the stern with integrated bathing platform all put you in the present of boating design. Still classic elements abound, like a wooden toe rail, the walk around feel associated with the traditional Italian fishing cruiser i.e Gozzo, and plenty of natural wood inside will make sure to take you back to the past too. Inside the 38 Serapo is spacious too offering two double cabins with owners stateroom to fore, and a further double guest cabin to starboard. There is also two saloons one on the lower deck, and another on the main. Galley is situated on the main deck. The enclosed hard top can be fitted with a patio door. Having a variable vee shaped hull the 38 Serapo is offered with four all Volvo engine options and two propulsion choices, being Volvo IPS or traditional shaft drive. 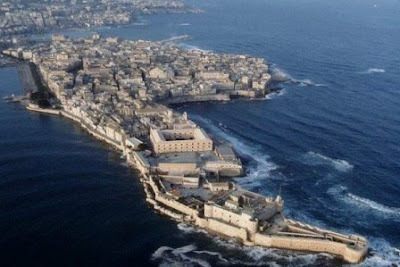 Powerboat P1 announces that Syracuse (Siracusa), Sicily will host the 2009 season finale on September 11-13, replacing Bahrain as the year's World Championship race. After a 5-year absence, Powerboat P1 will head back to the Mediterranean's largest and southern most island which dates back over 2,700 years to 734 BC. Its reputation and rich history as a leading city of the Greek, Roman and Byzantine empires, has endowed the city with a diverse and beautiful architecture and culture. The city of Syracuse offers excellent tourism opportunities for fans to explore its archaeological sites as well as the scenic island of Ortygia. Charming pizzerias, seafood restaurants and fine wines are among the area's tourist attractions. Its location on the Ionian Sea, between the Mediterranean to the west and the Adriatic to the East will offer racers a challenging offshore course. Bahrain has been cancelled as a request by the teams to manage costs as much possible, mostly because of the negative economic down turn hitting the globe in the last year. After various customers consensus the Aussie builder Maritimo Aegean range continues to be upgraded with the introduction of the A50 Aegean, and the A50 Aegean Enclosed. The first presentation goes to the luxurious enclosed flybridge of the A50 Aegean Enclosed, which offers uninhibited views of the seascape, but also another entertainment area where one can relax both indoors and out, thanks to the sliding glass doors in the aft balcony. With the helm station up top, there’s more room to move on the main deck, adding entertainment space to the A50 Aegean Enclosed. As well as being long on features, the A50 Aegean Enclosed has genuine long range cruising capabilities, and is designed with an advanced variable deadrise hull, engines and fuel tanks over the centre of buoyancy, and a shaft angle of just 9 degrees, thus resulting in an effortless poise, balance and fuel efficiency. Down below is a three double cabins layout, with a an owners cabin to fore, VIP cabin to port, and a single or double bunk cabin to starboard. Performance is an estimated cruise speed of 24 knots with twin Cats C12 715hp engines. 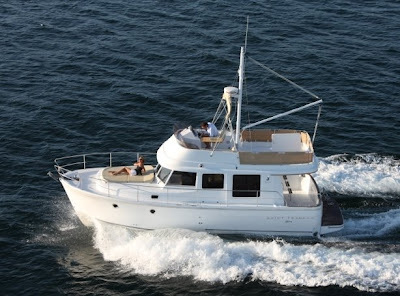 The standard Maritimo A50 Aegean follows the theme of the A50 Aegean Enclosed but has dual helm stations. Performance estimates also calls for an extra 1 knots of economic cruise of 25 knots, with the same C12 715hp twin Cats engines. The flybridge offers a central helm station, l-shaped settee to port, and a additional longitudinal settee to starboard. Inside is also the same layout with the removal of an internal staircase being replaced by the helm station, and flybridge staircase located aft in replacement to inside. Worth to note that all Aegean series have so far been derived from the same hull, with all offering an identical beam of 5.2 metres, reason for which speeds are similar. The existing Swift Trawler range is growing, and is joined by the launch of the new 34 Swift Trawler 34. A much expected smaller new edition to the Beneteau explorer boats range announced at the start of this year, benefiting from a semi planing hull similar to the one on which its senior siblings have built their reputation, and a visual appeal similar to the 42 foot big bigger model. The new small Swift is a collaborative between designers Joubert - Nivelt, and Beneteau's design team. The capacious cockpit locker is big enough to store every item of seagoing equipment. A hinged gate provides access to the transom skirt and its bathing ladder. Access to the generous sunbathing platform forward of the wheelhouse is either via the starboard passageway, or the wide and ultra-safe side deck to port. The flying bridge is surprisingly spacious and extremely comfortable, offering to port a large space to house the tender, whilst further forward is the starboard helm position and saloon with a six person table. The wheelhouse interior is accessed via a 3-panel sliding glass door that creates a perfect feeling of space. The saloon converts very easily to provide a double berth to starboard. Moving forward, is the port side helm station with its double bench seat. The removable floor step is retractable for easy access to the passageway via a sliding side door. The U-shaped galley with its double sink and choice of work surfaces is to port. The companionway leads to the port guest cabin with bunk berths and the starboard head. The bow compartment houses the generous owner’s cabin with its large double berth. The 34 Swift Trawler is extremely roomy, with a saloon, galley and owner’s cabin comparable in size to the accommodation offered in the 42-foot version; in fact, the finishes and woodwork are identical. Powered by a single Cummins 425hp diesel, it reaches a max speed of 22 knots. The hull is immensely stable when moored and underway, and berthing manoeuvrability is maximised by a standard bow thruster. Beneteau also points out easy access to the engine, plumbing and electrical systems making the small Swift Trawler easy to maintain and service. 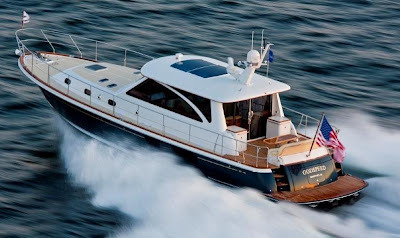 Bayliss Boatworks is another of the renowned or often referred to Custom Coralina Sportfish Yachts builders. Yes there is a dozen if not more of quality boat builders hanging in this renowned US boating region, and all can offer a diverse sport fish product to the other. Bayliss offers one of the most modern luxury orientated custom sportfishers, and is currently working on three important projects all built to owners desire with the cold molding, jig system. The smallest of these projects is the 65 feet hull number 12, scheduled for delivery in Spring 2010. Named Triple Net this is not a sister ship to the 2006 delivered 65 hull number six and in fact will be slightly longer, slimmer in the beam, and have a deeper draft. Hull number 12 interior layout will be a triple double cabin with three heads. Finishing will be in teak veneers and granite counter tops. Power will be from twin Cats C32 Acerts of 1900hp each. The second in size of these projects but most advanced in its building schedule is the Bayliss 68 Hull 11 Uno Mas. If the name stands for something this will be a second built by Bayliss to this owner, as he commissioned the 60 Hull 2 also also called Uno Mas and delivered in 2003. Commissioning date for Hull 11 has so far not been announced, and this seems a further expansion by 1 feet to the 68 Hull 9, with similar beam and draft. Her interior will be 4 stateroom with 3 heads. Power will be twin Cats C32Acert of 1925hp. 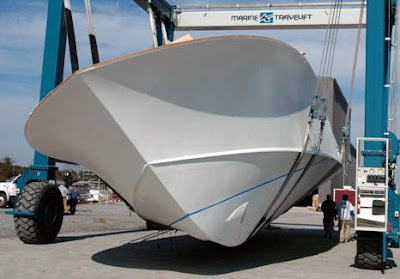 73 Hull 14 will be the biggest build to date by Bayliss, expanding its flagship size to five feet more versus the 68 hulls 08, 09 and currently in construction 11. The interior will offer four staterooms, with three heads and what appears to be a day head. Power will also be from twin C32 Acerts 1900hp engines. Delivery date is scheduled for June 2011. 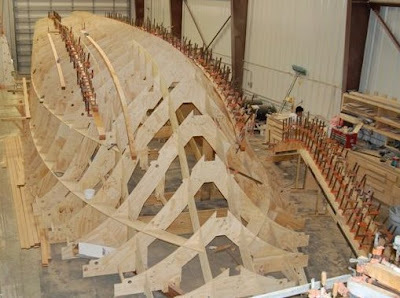 As all Bayliss Boatworks custom builds the projects come from the hands of John Bayliss, with the collaboration of naval architect Robert Ullberg. Australia's biggest boat show prepares its 2009 showing, with a stunning line up of boats on display, and new models to be shown for the first time presented by down under respected boat builders. 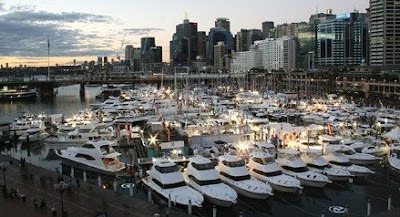 The Sydney boat show opens its doors on Thursday 30th July, and ends on Monday 3rd August what is five days of exhibition in five halls, and a fully packed up marina with the bigger boats. The Sydney boat show will have about 250 exhibitors, and apart from new models, boats of all sizes, and various accessories it also offers entertainment and education for the sea goer. This year new models despite a global economic down turn continue to be numerous. Riviera Australia's biggest and most famous builder present another edition to the Sport Yacht range with the 5000 Sport Yacht. Maritimo will show case three new models of which is also the expected 73 Cruising Motor Yacht flagship of the range, the A55 Aegean Flybridge, and A55 Aegean Enclosed. Mustang will also show case its new 480 Sports Euro, what is the second edition of the new Sports range. Aicon Group is the core company owning the Aicon Yachts and Morgan brands. The Aicon Group website is totally new and focuses to show the core activities of the two renowned brands. 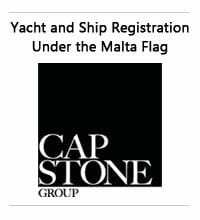 Starting up in 1993 as a turnkey interior design solutions for yachts, the company moved to Sicily in the Messina area in 1996, and in 1999 it showed its aim to become a boat builder. In 2001 Aicon launched its 56 model, a stepping stone for the builder and a great success which also received the 2002 Cannes World Yachts Trophy in its size. In 2007 Aicon acquired the Morgan brand, making it become a Group and the company also went to be listed in the Electronic Share Market. The new Aicon Group web site guides into five main tabs: The Group, Business, Governance, Investors, and Media. The main page has also direct logo links to the two brands Aicon and Morgan, a Documents area, a Home area showing the latest news, and the chart of Aicon in the stock market showing the actual share price of the company. There is also six other buttons named Tools, which are: rss, e-mail alert, aicon around the world, archive, glossary and contact. Moonen launched the longest, highest-displacement yacht it ever built, with the new 38 metre 124. Bringing it out of her construction hall and launched into the Lek River, the 124 had been under construction in Moonen’s Groot-Ammers hall since May 2008, when her steel hull and aluminium superstructure were delivered by barge, then welded together. The move of this flagship build by the dutch builder which displaced about 275 metric tons in light-ship condition, was accomplished by a highly efficient Saan transporter with more than 150 independently controlled wheels. The transporter slowly positioned her at the river’s edge where two high-capacity GPS floating cranes lifted her from the construction cradle and launched her. The Moonen 124 was shaped by René van der Velden Yacht Design over a hullform by Stolk Marimecs naval architects. She is the first Moonen yacht with a four-deck central atrium and spiral staircase. Her layout features a main-deck master suite forward with veranda. Below, two double and two twin guest staterooms centre on the stairs, with crew quarters forward. The Moonen 124 has an innovative interior by Art-Line featuring "fusion" styling of western cherry joinery "spiced" by Oriental details. The wheelhouse is a fine example of ergonomic planning. 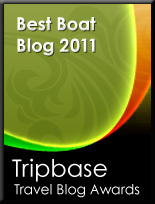 PowerYachtBlog previewed the project of the 108 back in May 2008. Now along comes the press release of Pershing and new renderings, showing further development to this project looks outside, inside and other important technical advances in propulsion and speed options. This new Pershing continues the combination of designer Fulvio De Simoni and vision of Tilli Antonelli, Chairman and Founder of the shipyard, and features the concept of versatility in its DNA. Thanks to the fundamental support of the Pershing technical staff and Ferretti S.p.A.’s AYT, the 108 will show graceful, easily recognisable lines which characterise the entire Pershing range: the windows in the superstructure continue to be developed in accordance with the shipyard’s philosophy, whilst it features a beautifully aggressive profile, technological advances and, of course, Pershing performance. Owners and their guests become protagonists in the Pershing 108’, due to a radically innovative internal layout, featuring areas which can be modified to suit any given situation. Painstaking care has been taken over the elegance of this model, working with well-established partners such as Poltrona Frau and new, exclusive ones, like ErnestoMeda. The performance of this model is fully in line with Pershing’s style, and features one important innovation. For the first time ever, the shipyard has decided to fit split engines on one of its models, focusing on ecology whilst still maintaining high performance. The standard version is powered by three 1815kw MTU diesel engines, combined with the thrust applied by three Arneson surface propellers, driving her to a speed of 41 knots. The central engine ensures correct air intake and a constant performance, whilst the hull structure has made it possible to create a particularly efficient engine room, with clear advantages for the living areas. This cutting-edge technology also offers owners a number of navigation alternatives. Specifically, she can achieve extraordinary range when only using the central engine, and sail at 11 knots for 1070 nautical miles. Of course, the Pershing 108’ can also maintain a cruise speed of 23 knots, whilst operating on two engines. Architecture, space and design, from stern to bow, were the overriding criteria for this project, and making her the reference point for the international nautical industry. The foredeck bow area features a semicircular sofa and a table which can be lowered to the height of the seating in order to create a single sundeck area protected by a retractable bimini top. A large upper sundeck has been designed in such a way that it features an area where those aboard can relax in the sun in complete privacy. This unbelievably spacious sundeck features an innovative steering console, two wide sundecks, an ice box and large C-shaped sofa with a table which can also be lowered to the height of the seating. 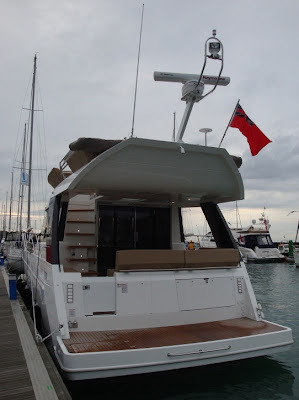 It features a small goods lift which goes down to the galley, and bimini top, making this area both independent and functional, and enabling those aboard to relax completely, and enjoy themselves. The large cockpit is a vast covered area which can be used both during the day and in the evening, and features two sofas set directly opposite each other, a table which can seat 10, a bar unit and another large sun pad area. The design of the interior is characterised by the use of “Canaletto walnut” for the furniture and by subtle indirect lighting. However, it is natural light which is the greatest feature of the architecture of the salon, due to the generous openings of the large side windows and exclusive concealing salon door, which consists of two independent sections featuring electro-hydraulic controls, and can slide into the floor to create a single area measuring over seventy squared metres. In the aft part of the salon, there is table for 10 and a large C-shaped sofa produced by Poltrona Frau. The sofa has been positioned to face a AV unit housing a television with high-low lift, and the area also has a fridge, and storage for the Christofle tableware. The helm station comprises of three comfortable, central, adjustable seats, produced in collaboration with Poltrona Frau. The steering console features the most modern navigation and communications technology currently available, and the instrumentation panel is equipped with cutting-edge solutions, such as the new Furuno system. Access to the accommodation area below decks is provided by a large stairway leading downward from behind the steering seats and comprises a large VIP cabin in the bow, 2 twin guest cabins, and a full beam master cabin in the centre of the yacht. The use of Poltrona Frau leather throughout the seating and beds, ensures each cabin is both welcoming and sophisticated. Located in an unique position due to its perfectly square shape, the VIP cabin prevents those aboard from feeling they are in the bow, and offers complete comfort. Both guest cabins, featuring twin beds and en-suite heads, are an extraordinary step forward in terms of on-board versatility. Indeed, they allow owners to alter the layout of the cabin according to their requirements. The beds have been designed in such a way they can be set side by side to form either a king-size or two singles. The large windows which characterise the master cabin allow for evocative natural lighting. Different interior layouts are available, making this a semi customised area and can be fitted out to owners choice of free standing furniture, i.e. beds, armchairs and tables. Additionally, this area features a walk-in wardrobe or fully equipped studio. The cabin has been finished with a large, en-suite head and separate sanitary-ware. A 5 cabin version of this model is also available, where the studio/cabin can be replaced with another single cabin. Crew accommodation is located astern, and accessible both from in and outside the yacht. It features three cabins with excellent services, laundry and a dinette connected to the galley. The Pershing 108 features a creative solution for an important section of the layout, setting the galley in a passageway in her lower deck. This unique space also hosts a dinette area , enhancing the important, convivial role of the preparation area. Pershing’s new working relationship with Ernestomeda has made it possible to design a galley with real character. Bases and shelving have been chosen from the Elektrarange, in Vetro Lucido (polished glass) with an aluminium frame and Less Marine® handle, all in black; Top Feel tempered, ultra light, black glass, h. 6 cm. ; polished stainless steel backboard; aluminium structures (Doluflex) incredibly resilient surfaces, and with no harmful emissions. Additionally, the revolutionary ceiling-mounted “Nuvola Stripe” hood, has made it possible to save space whilst guaranteeing the purity of the air. The innovative push button closing system, integrated into the Less Marine® handle on the thickness of the panel, and designed and patented by Ernestomeda, prevents involuntary opening in any sea condition and at all speeds. The galley features a small goods lift which rises to the sundeck, guaranteeing a service of excellence. A large hangar, with drop-down swimming platform, able to house a 5 metre tender, is located astern. Pershing 108’ provides for a second tender locker in the bow, which stores water toys and the lifting crane. The detail, is in the design of the Pershing 108, which once again affirms the decision to make materials, solutions, technology and style into something truly unique. Menorquin shipyard continues to expand, offering new products and services to meet market demands and also in designing strategies to provide solutions to different sectors of the business. It is along these lines and in direct response to the needs of this particular sector of the charter market that Menorquin is launching a new option for the MY 180. The charter version of the current flagship from Menorquin will be manufactured to order only and presents some very attractive innovations which will exceed all possible expectations of those looking for the latest in an 18 metre charter boat thanks to an unbeatable deck design, a tremendous feeling of space and superb comfort. The new version of the Menorquin Yacht 180 for charter has unbeatable living spaces which are in part due to the wheelhouse pilot station having been dispensed with. This means there is now a single central pilot station on the flybridge, which simultaneously provides additional space on the upper deck and may also be used for adding extra equipment. The wheelhouse has been equipped with a double sofa and dining table to seat up to 8 people and is ideal for entertaining on board. The cockpit provides exterior seating around a semicircular sofa and table, all designed and finished with elegant teak finishes. The generous sundeck can be reached along the spacious side decks and has an awning to provide protection from the sun. The lower deck of the new Menorquin MY 180 charter version houses four fabulous passenger cabins. These four cabins are supremely welcoming; all offering en suite head facilities. Two of the cabins offer single beds whilst the other two have doubles. There is also the independent crew cabin to fore towards the bow, with capacity for two people, a washroom and is accessed from the main deck. Another detail which has been incorporated in this new model is the addition of a compact living space with a table and chairs off the galley, located on the lower deck for the crew members, with the aim of making their work on board comfortable. Add to these innovations the most representative qualities of the Menorquin Yacht 180, such as the classic design fused with modern engineering and the economic to run semi displacement hull form a timeless, functional and stunning yacht. The new Sunseeker 74 Predator follows the themes shown on the 92 Predator Sport and 84 Predator, offering a sport bridge second helm station area up top. Its design also provides total flexibility to meet the requirements of either owner driver, or a crewed operation motor yacht. The 74 Predator is also offered with the choice of either a standard hardtop or optional sports flybridge, as pictured above. Lower deck layout configurations, add to the versatility of this model, being available with a triple cabin six berth plan or add an extra cabin with double bunks for extra guests. A double crew cabin with head is located aft. Twin diesel options are available up to a total of 3144hp, which can give wide open throttle speeds of 42 knots, with an economical cruise of 25 knots. Following the success of the new 75 HT flagship from Cayman Yachts which received a lot of attention during the 2008 Genoa Show, and will be delivered in two further examples this year, Cayman unveiled two further projects of the HT line presenting a 55 and a 65 earlier on this year. This new 60 HT project is a further development of the 55 HT, improving the underwater lines for bigger propulsion usage, and having further space on board. Confirming this size increase is further accommodation below and bigger engines compared to the 55 HT project. The concept seen for both the 55 and 65 HT is kept similar in the 60 HT, offering living on the main deck, and a lower deck reserved for accommodation. Size and space increase is the adding of an extra third en-suite head for the third guest cabin, versus the two en-suites in the 55. Power now has also been increased offering twin engines up to a total of 2400hp versus 1800hp for the 55 HT, with an anticipated maximum speed of 33 knots and all time cruising of 29 knots. Delivery of the first unit is scheduled for this summer with a second being also in building stages. Last produced in 1997, the Nordic Tug 26 is back by popular demand! With its nostalgic appeal, rugged construction and notable fuel economy, the Nordic Tug 26 became an immediate success in the marine community at its debut in 1980. The Nordic Tug 26 today is as fuel efficient as its predecessor. With a 110hp Volvo D3 diesel engine with electronic controlled high pressure common rail fuel system, take a leisurely cruise and burns less than 1 gph at 6.0 knots, or speed her up and burn 2 gph at 8 knots or under 5 gph at 10 knots. For quick weekend getaways, the 26 reaches top speeds of 14 knots. With room to sleep 4, including a forward stateroom with a wet head plus a convertible salon settee, the Nordic Tug 26 is a great choice for couples and small families. The semi-displacement hull provides a smooth ride and can handle challenging waters as only a Nordic Tug can. Its full keel provides precise tracking with resistance to drift or roll. A heavy-duty stainless steel shoe protects the propeller and rudder, while the hard chine adds to ride stability and reduces roll while at anchor. With full visibility from the pilothouse and direct access to the deck on both sides, solo handling is a breeze. The new Nordic Tug 26, features the seaworthiness and fuel economy that started it for the US builder, and is the rebirth of a classic. Formula's 290 Sun Sport, is the latest new model to be launched by this legendary US builder founded in 1956 and always a hot name when it comes to fast and sea worthy boats. The Sun Sport is one of six ranges which offer a total of twenty two boat models from Formula, and is an interesting concept offering aggressive sleek powerboat looks united with additional cruising comfort. If you think the Sun Sport concept is new for Formula, think again! As the first Sun Sport, the 242 was launched in 1983. The 290 Sun Sport is the latest addition to this range, launching in January this year and being presented officially to the general public during the Miami boat show. If you like high performance and want a quality ride, but also want generous accommodation with an exterior that shows comfort this surely should be one of your first stops. The 290 Sun Sport takes also many of the innovative cockpit seating ideas as seen on the bigger 310 transforming this area from lounge area to sun worshippers dream in minimum time. The intelligent use of space without sacrificing low profiled sleek looks is the icing on the cake for the 290 Sun Sport. Once you get on board the extended bathing platform aft shows spaciousness in the cockpit offering comfort, and seating space associated with a bigger sized boat. Here one finds a nice center located two person sun lounger, followed by a spacious C-shaped settee, and the dual seated helm station both of which lie to the port side. To starboard opposite the c-shaped settee you will find a well sized wet bar, and a single person settee. For sun lovers both the aft sun pad and c-shaped settee, can transform and become one big lounge, making this place a nice sun worshippers paradise. High speeds of over 50 knots have always been a trademark for this US manufacturer who did history in the past of powerboat racing, and still continues to do so. Designed by John Adams who joined Formula in 1971 and is their exclusive designer since that time, the 290 Sun Sport takes this heritage in its hull, with a pure deep vee hull offering a twenty two degrees dead rise calling for powerboat performance and being a reassuring cutter in the chop. The 290 Sun Sport is offered with four gas petrol engine options, standard power being a twin Mercruiser 350 Mag 5.7 litres 300hp each. Other options are a similar 5.7Gi 300hp Volvo, 5.7 GXi 320hp, and the most performing Mercruiser 377 Mag. Propulsion is Mercruiser Bravo Three stern drive, or Volvo DP all being offered with dual counter rotating propellers per drive. The slowest performer of these options is Volvo 5.7Gi giving a speed of 52-55 mph depending the load, with Mag 377 being the faster thanks to a bigger 6.2 litres block which will give you a speed range of 55-58 mph or 50 knots of max speed. Offers in this size and style, come mostly from US and European builders. The difference from the continents can be felt with the Americans offering more sleek looks, and the European going for more bulky and high free board exteriors. The Formula together with the also US built Monterey surely stands out for low profile exterior looks, which gives a different meaning to luxury outside. Deep vee hulls of twenty or more degrees of dead rise seems also common in all the US builds here. Criteria for competition has been based for eight metres in over all length, a cabin with double vee berth, and enclosed head. Standing at twenty nine feet the 290 Sun Sport is at the middle of this range from Formula, offering what is an interesting boat for first time buyers who want the speed and sea keeping associated with a fast boat but still not wanting to miss additional comfort for a weekend cruise. Formula also offers various color contours, plus additional equipment which can make the 290 Sun Sport a unique boat for each owner. The outside cockpit is surely a deal breaker alone, but associated with the comfort of the cabin below, additional extras which add superior live ability, and the deep vee ride of a Formula makes the 290 Sun Sport a high rated competitor in its style and size. Picture Copyright Formula. Data Formula. Mustang continues to upgrade its new European styling across the Sports range which debuted with the 430 Sports Coupe, with the new 480 Sports Euro being the second of the line up. 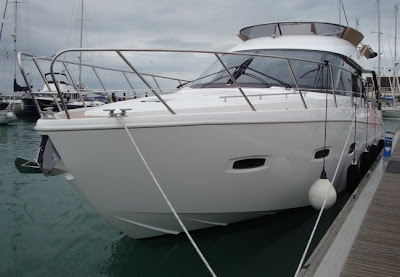 This Motor Cruiser has many distinctive features of the 430 but is also a bit longer, and will also feature a flybridge. The 480 Sports Euro is to be presented officially in a weeks time during the Sydney show, and features as the title says European styling integrated with the latest technology, added with a stylish and functional Euro Flybridge. The 480 Sports Euro will be the first Mustang to feature “Bio eStart – Fingerprint engine starting technology”, which eliminates the need for engine keys and traditional Start Stop panels, and replaces them with a stylish flush mounted LED backlit device with LED indicators. Mustang owners will be assured an easy boating experience, without the need to hide or remember their engine keys before going boating. The 480 Sports Euro will also feature the popular electronic vessel management system, with either Volvo IPS or Cummins Zeus pod drive systems, hydraulic boarding platform, and modern vanilla oak timberwork finished interiors. Mustang gave little information on engine HP, speeds and layouts but advised that a further extension to the Sports range is in advanced development with the third model a 550 Sports Euro schedule for launch in December. Last month Nord West launched a first boat the 370 SportsTop with a new system called Stern drive Joystick. Similar to the IPS this new drive system has electrical steering and maneuvering in harbors can be done very easily thanks to easy to use joystick control. Nord West was among the first users of Volvo IPS system as well as being among the first to make a special designed hull for the propulsion. Every boat can be installed with a maximum of four joystick controls. With the new system stern drive with joystick Nord West adds as promised an other model the 370 Coupe following the 370 SportsTop with this exclusive option. Nord West also advised that a further two models making the total to four will be available with this new stern drive joystick system. Astondoa presents the project of the new 50 Fly. The 50 Fly will replace the 46 model, presented in the end of the nineties and being one of the successful models built by Spain's largest motor boat builder. With this project Astondoa seems set to present one of the most spacious boats for its size and type, with large cabins shown on the so far presented plans. The 50 Fly seems to challenge the competition in all areas, offering the right mix in all parts of the fifteen metre motor yacht. Flybridge space is abundant with a c-shaped settee on the aft part. Main deck follows the theme with a c-shaped saloon settee to starboard upon entrance, and the much missing in most of today's offers off a dining table for four persons to port. The lower deck impresses the most, with three double cabins, three heads, and a galley situated upon descending the stairs. Don't be mistaken but in all this Astondoa also found space for the much requested full beam owners cabin. There is also the availability of an optional crew cabin with own shower head aft. Performance and engine options has so far not been communicated, although I imagine the use of pod drives or an integrated vee drive solution, moving the engines as much as possible aft, in order to gain more space for the cabins. 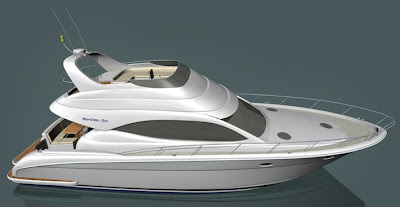 A similar solution to what Astondoa used on its also very spacious 44 Fly model presented in the fall of 2007. The new Hunt 52 is the flagship of this US builder offering Traditional Yacht line in elegant classic lines and large motoryacht feel with seamless integration of single-level deck and interior liveability. Featuring a natural flow from the helm to the open, bright salon through to the aft deck, the Hunt 52 layout reveals the same unobscured 360 degree views from any position. Exhaustive attention to engineering a boat which can be easily handled by one, or enjoyed by many, has led Hunt to offer features such as joystick control of bow and stern thrusters, fully mechanized dinghy garage transom with stairs, and generous swim platform for easy accessibility. All of this comes without diminishing the unparalleled rough water capability equalling to a fast, easy running, comfortable and dry ride. Interior for the Hunt Yachts new 52 flagship offers two alternative layouts dependable on the type of propulsion chosen. Standard plan is twin double cabin plan with the traditional shaft line propulsion, but with the optional IPS engine choice this can give an extra third cabin with full beam VIP statreoom. There is also the option of choosing a galley up or down solution. Engines options is a three engine choice with standard twin Cats C12 of 705hp each, up to Cats C18 of 1001hp with traditional shaft line, or in alternative a more modern solution with Volvo IPS900 of 662hp and the famed forward looking pods. After cancelling race one for the BMW Norwegian Grand Prix due to bad weather, the second race went on as scheduled seeing Victory 1 rookie driver, Mohammed Al Mehairi, to his first Class 1 win in just his second outing. Maritimo 11 was rewarded for a stunning opening lap with second place, to take their first Class 1 podium finish, with other team boat Maritimo 12 giving further cause for celebration, taking their first podium in third place. Championship leaders, Fazza and Qatar 96, both suffered misfortunes; Fazza stopping due to technical problems, with Qatar 96's race ending in spectacular fashion, barrel-rolling on lap seven. The Victory duo of Vicory 1 lived up to the promise they showed in the morning's practice and qualifying session, setting the fastest time to take their first pole position, with a richly deserved win. However, Victory 1 did not have it all their own way, when Fazza showed their pace to take the lead from their team-mates on lap six. But a technical problem ended their hopes, with Victory 1 going on to take a sensational win. The win is the ninth of Sanchez's career, but he was quick to give credit to his pilot Al Mehairi and his crew. The win takes Victory 1 to the top of the Championship standings after two rounds. Maritimo 11 made a flying start to the race, moving up from seventh place on the second row to third at the end of the first lap. They held position until lap six when they were passed by Qatar 96, who then handed back the place a lap later, barrel-rolling in stunning fashion right in front of Maritimo 11. Maritimo 12, made it a double celebration for the Australian team grabbing a surprising third place. Foresti & Suardi - Roscioli Hotels' Giampaolo Montavoci and Giampiero Soave, racing together for the first time in five years, produced an impressive showing to finish in fourth place, equalling Montavoci's best ever finish in Arendal, and moving the Italian pairing into third place in the championship standings. Despite making a good start, moving up from fourth at the start to second place at the first corner and then passing their team-mates to take the lead on lap six, an electrical problem on lap 12 ended Fazza 3 hopes of a second consecutive win, eventually finishing fifth to salvage valuable points. For the Spirit of Qatar Team it was a race to forget. Both Qatar 95 and Qatar 96 got squeezed at the start to lose ground and it went from bad to worse, when, on lap seven, Qatar 96 barrel-rolled. On lap 11 a blown engine did for team-mates Abdullah Al-Sulaiti and Matteo Nicolini in Qatar 95 to compound a very disappointing weekend for the team. Welmax's defending European Champion, also had a frustrating race, first throwing a propeller blade and then a technical problem on lap 13 ending their race. 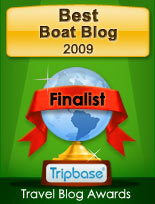 While Giorgioffshore, were the first to retire after an engine failure prevented them from continuing.